July is definitely summer, and summer in Ashland means being outdoors – hiking, waterskiing, mountain biking, and walking through Lithia Park. Branson’s Chocolates has the perfect treat for all this summertime fun – Chocolate Dipped Fruit, which just so happens to be our Product of the Month. We have dried bananas, apricots, apples and pineapple, crunchy freeze-dried raspberries – all hand-dipped in our famously delicious Belgian Chocolate, choose from either Milk Chocolate or Semi-Sweet Chocolate. Add Chocolate Dipped Fruit to Peanut or Hazelnut Chocolate Clusters and you’ve got yourself some gourmet trail mix. Chocolate Dipped Fruit is also perfect for bridal and bay showers, as an on-the-go snack, and especially for your “Everyday Indulgence”. All of our Products of the Month, including this month’s Chocolate Dipped Fruit, are featured in Chocolate Talk videos on our Youtube Channel. My brother-in-law Brian Goodwin films a video every month of me talking about how we make our Product of the Month. We started making the videos in January, when we started featuring a Product of the Month. Each month I highlight a different chocolate confection, either a favorite, a classic or a new creation. Now at Branson’s Chocolates we’ve kicked it up a bit to include Chocolate Dipped Dried and Freeze-dried Fruit, for us these are tasty new creations. I was so pleased to be asked to do a Locals Guide interview this month. Check out the interview and read all about MY favorite chocolate’s, our surprise best seller, and why chemistry is important. As an added bonus, discover our Locals Guide Readers Special for July. And then come on down to Branson’s Chocolates, get yourself some Chocolate Dipped Fruit, and have an amazing Ashland summer. Born and raised right here in Ashland, Deena Branson had a love of chocolate from a very young age. After working at Ashland Fudge Company for a decade downtown, she never dreamed that she would one day have her very own chocolate company. “I always knew I would own my own business.” says Deena, “I just never thought it would be chocolate.” Nine years later, Branson’s Chocolates provides local businesses such as the Grange Co-op and Paddington Station with custom labeled bars and Deena’s list of wholesale clients just keeps growing. If you haven’t stopped by, you must. Branson’s Chocolates, located on Siskiyou Boulevard just past Walker Street, smells wonderful. With copper kettles bubbling and cooling pans of deliciousness within sight as well as display cases filled with truffles, bars and beautifully wrapped delights, the shop is an experience not to be missed. We met up with Deena recently to learn more about her sweet business. Thanks so much for talking with us today Deena. Your shop is amazing. How are things going now that you have had the retail space open for over a year? Things are good. We have always wanted a space where you could get our chocolate and confections. We are having fun this year with our Product of the Month that ties to our YouTube channel where we talk about and show the making of the product of the month. You grew up here is Ashland and have a long family history here in town. Yes, my dad (Rex Bounds) moved here when he was 4 years old and my entire family still lives in the valley. Dad has the oldest U-Haul dealership in Southern Oregon and mom (Jeri Bounds) has been doing hair for over 50 years. My youngest sister (Shelley Underhill) worked at the Ashland Branch of Umpqua Bank (formerly Sterling Bank and I have been told she knows everyone by name. My first job was at Big Al’s Drive In where I learned to make a killer milkshake. How have you developed your recipes over the years? When I create the many different products I always start with the best ingredients that I can find. Quite often I source directly from the growers. From there we carefully measure all the ingredients to ensure that every batch comes out to perfection every time. I have taken some of the old Ashland Fudge Co. recipes and tweaked them to make them our own, along with creating new recipes. Chocolate making involves quite a bit of chemistry. Did you realize you would become such a scientist? No, I never would have guest that I would use chemistry in my life. If I would have, I would have taken chemistry in school. Chocolate is very temperamental in temperatures and what you can mix with it and I think chemistry would have helped me understand more. What did it take to get here Deena? Lots of hard work and determination. Both my parents are self employed so I had an idea what it would take. The first 8 years I worked full time as a server here in Ashland while working full time making chocolate. With the support of my husband (Kevin Branson), family and friends the business grown to where we are now. Before taking on a new customer I always made sure we could handle the volume without compromising the product. I understand that the Ashland Fudge Company had a lot to do with your beginnings. Ashland Fudge Co. (where Mix is now) was a good place for me for 10 years. I worked for all three sets of owners and even helped train the last two. I learned about managing a staff and inventory control. During the tie I was at Ashland Fudge Co. I would hire an average of 12 high school students every year, many of them would come back for during the summer break from college. This is where I really learned to love chocolate and where I met my husband, Kevin Branson. I learned about chocolate making by watching and asking questions. I was never officially taught how to temper chocolate. Tell us about some of the partnerships that you have established over the years with other local businesses. 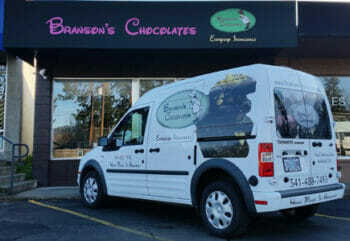 One of Branson’s Chocolates first customers was Mix Sweet Shop, they carried our Peanut Butter Cups and Truffles. I then met Pam Hammond when planning a Mother’s Day fundraiser for the Ashland Rowing Club back in 2009. Shortly thereafter Paddington Station started carrying Branson’s Chocolates and now we are in all three of their locations. Ashland Springs Hotel asked if I would make Chocolate Bars for the, never having mad bars before, I said yes and now we make over 20 types of Chocolate Bars. We have proudly been making Chocolate Bars for Tudor Guild for tow years now and last year they started carrying our English Toffee last year. December 2012 we became the first Rogue branded food product with the Grange Co-op, which has been a perfect match. Your wholesale clients keep you very busy. What are some of the ways that businesses use your chocolates in their marketing or promotions? We can custom label just about any chocolate that we make. 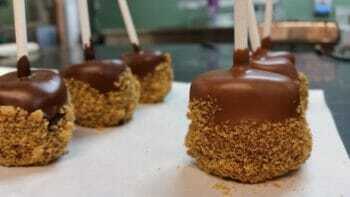 We also can make custom molded chocolates. I you have been to Blue Giraffe Day Spa and seen the chocolate with “BG” on it, that is and example of a custom molded chocolate. 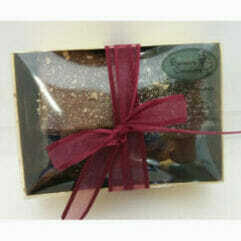 We can make custom chocolate that is given out as customer gifts. In the case of Anderson Auto Body, they give out a box of chocolate with each repair. AmeriTitle gives chocolate out when you sign documents with them. I even drop ship customers gifts for Butler Automotive Group; which means you give me the customer information and any note that you would like included and we ship chocolate to the customer year round (we have ways of shipping during the summer). We even have done fundraisers; the most recent one was with the Le Cirque Centre. We mad WONKA Bars for the Willie Wonka and the Chocolate Factory show last year. I have always gone for the more traditional combinations of Peanut Butter and Chocolate (PB Cups) or Caramel, Almonds and Chocolate (Ashland Nugget). But I made something new recently that I am enjoying. It is a Smoked Sea Salt Caramel; the sea salt has a slight smoking flavor from the English Oak that just enhances the dark chocolate that surrounds a soft chewy caramel. What chocolate has been a best seller that surprises you the most? Tequila Truffles, my husband is a Tequila guy. He bugged me for three years to make a Tequila Truffle. I kept saying it won’t sell. When I finally deiced to make one I said we had to do it right. So I created the Tequila shot in a Truffle. It has the lime the sea salt and we use Patron in the center. The first show that we took it to they sold out. Now my husband gets to tell me “I told you so”. Any specials to offer LocalsGuide readers? Yes, when you come in mention that you read this interview in the Local’s Guide and get a free caramel, either plain or salted. (One per customer, offer good through the end of July). Do you ever get tired of chocolate Deena? No, I actually average a piece a day. There are some days that I don’t have any chocolate but others… well the piece is an entire chocolate bar. And yes I even have days where chocolate is lunch. 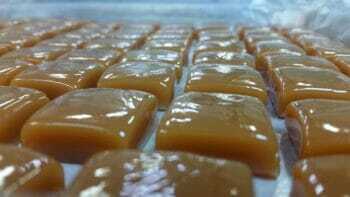 At Branson’s Chocolates, we make our caramel, and everything else, by hand. We use a very old recipe, the highest quality creams and sugars, and cook our caramel in cooper pots the old-fashion way, all to achieve the best blend of sweet and gooey, without being sticky, caramel. We serve our caramel plain or sea-salt; dipped in milk chocolate, semi-sweet chocolate, or nothing at all, in sticks, squares, bars, and in our turtles with pecans or cashews. In other words, there’s a caramel for everybody. Our Product of the Month for June is Smoked Salted Caramels — five squares of delicious caramel, dipped in semi-sweet chocolate, and topped with smoked sea salt — simultaneously sweet and savory, all boxed up perfect for Father’s Day, or any day. If you are a Father, or know a Father; or you might be going to a smoky, salty BBQ for Father’s Day; or maybe you just like smoky, salty BBQ’s or even smoky salty, sweet caramel, especially when they are dipped in delicious semi-sweet chocolate, you should definitely get yourself down to Branson’s Chocolates and pick up some of your soon-to-be-favorite caramels, for yourself and for your favorite Father. When we (Deena & Kevin Branson) started Branson’s Chocolates in 2005 we were working out of an industrial kitchen in a business complex producing mostly for wholesale customers. About 18 months ago we moved to, 1662 Siskiyou Blvd (where the Mongolian BBQ used to be). Now we have a retail space as well as production space, so you can get Branson’s Chocolates at our retail store or at your favorite stores around town. We make everything by hand on site, which means when you walk in to buy chocolate you can smell the delicious chocolate, you can see all the production and packaging happening, and you can even talk to us while we work. We have kept some of the traditions from Ashland Fudge Co. (where Deena got her start in chocolate), and added many signature products. So you will find Ashland Nuggets (formerly Porkers) and the traditional clusters and caramel sticks along with some nontraditional items, like Tequila Truffles and Cayenne Cherry Chocolate Bars. We strive to support other local small businesses so we buy our peppermint and lavender oils and some of our nuts directly from the growers. We also use as many natural ingredients as we can. 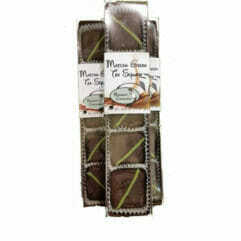 The chocolate that we use is high quality Belgian chocolate that is extremely smooth and creamy. YUMMM!! We try very hard to keep our case Gluten Free as well as offer Dairy Free and Sugar Free options. We price our chocolate for your “Everyday Indulgence” and not just that occasional gift. We love getting to know our long-time customers more every time they come in. we also love meeting new people that have “just found” us or have “been meaning to stop by” and finally did. We want to become the place you go for special occasions, that gifts, and especially the “Everyday Indulgence”. 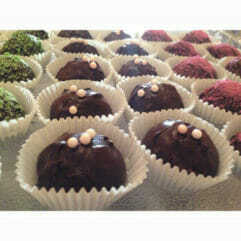 Please stop by, say “Hi”, and get yourself a piece or two of chocolate for your own “Everyday Indulgence”. 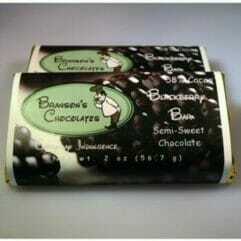 In December 2005 they opened Branson’s Chocolates, which is now located at 1662 Siskiyou. Both Kevin and Deena grew up in the Rogue Valley. Kevin graduated from Crater High School and has worked in the Ashland area for 26 years with ASLCO (American Linen), while Deena was born and raised here, growing up on middle Clay Street. The full March 2015 article can be found here.